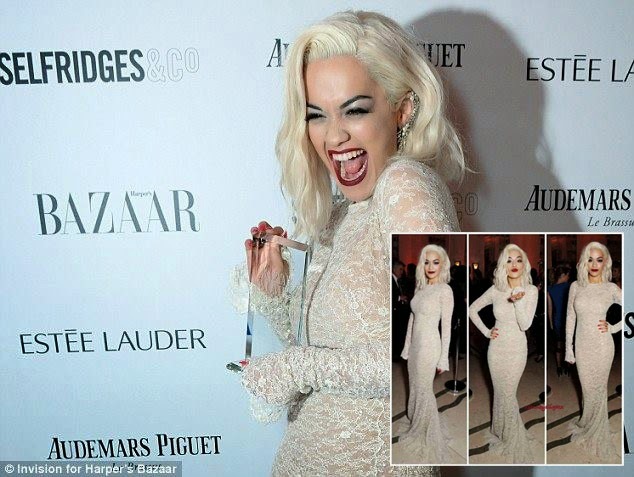 Rita Ora appeared stunning and has received numerous compliments for the dress, in an important annual event that awards prizes for successful women from different fields of showbiz world as cinematography, fashion, music, television, etc.. It's about "Harper's Bazaar Woman of the Year Awards", which was held on Tuesday 5 November in London, where Rita was awarded the "Musician of the Year 2013" for her achievements in the field of music. Rita has not hidden enthusiasm for this award by posting a picture with the trophy in hand. "Now I am real woman! I spent an amazing night. Harper's Bazaar Thank you for making me" Woman of the Year ", truly an honor", the singer wrote on Instagram. Rita Ora eshte paraqitur mahnitese dhe ka marre komplimente te shumta per fustanin, ne nje eveniment vjetor te rendesishem qe ndan cmime per femra te suksesshme nga fusha te ndryshme te botes se showbiz-it, si kinematografi, mode, muzike, televizion etj. Fjala eshte per "Harper's Bazaar Woman of the Year Awards", qe eshte mbajtur te marten me 5 nentor ne Londer, ku Rita ka marre cmimin "Muzicientja e Vitit 2013" per arritjet e saja ne fushen e muzikes. Rita nuk ka fshehur entuziazmin per kete cmim duke postuar nje foto me trofeun ne dore. "Tani jam grua e vertete! Kam kaluar nje nate te mahnitshme. Falemnderit Harper Bazaar qe me bete "Gruaja e vitit", vertete nje nder i vecante! ", ka shkruar kengetarja ne Instagram.